Reconnect with your roots! Adoptees, foundlings, and others with unknown parentage face unique challenges in researching their ancestors. 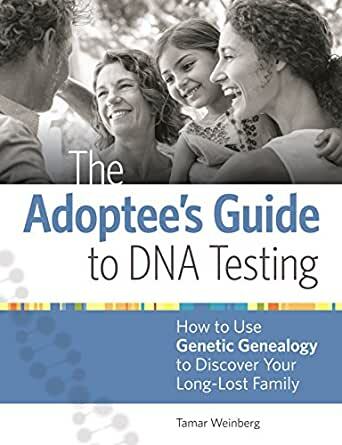 Enter this book: a comprehensive guide to adoption genealogy that has the resources you need to find your family through genetic testing. Tamar Weinberg (New Rochelle, NY) www.tamarweinberg.com is a writer, web manager and marketing consultant who wrote The New Community Rules. I am helping someone who is not an adoptee but found out through DNA testing in his late 60’s that he has a different father and his known parents are long gone. As a newbie DNA genealogist. I found a lot of helpful paths to pursue. I particularly like the section on Advanced Tools, like how to use mirror trees, analyzing with GEDmatch and the chapter on triangulating data. Just starting to read the seven case studies, which should give me more insight about the whole process. There are a lot of good books on the market out there on using DNA results to find family members. This is one of them. Although the author spends much of her time relating her own experiences in dealing with the fact that she comes from an endogamous population, don't let that scare you off from reading the book. For those who don't know already, endogamy is the practice of marrying within a particular social group, caste or ethnic group. The title is a bit of a mis-nomer in that most of the information about how to use DNA testing isn't really limited to adoptees. The book has some useful diagrams as well as good descriptions of the pros and cons of all of the most well-known DNA testing companies. Much of what I read was already known to me but the book did serve as a good refresher course and it is useful to have the descriptions of all of the testing companies in one place rather than having to visit the website of each of them (although that would still be advisable). For those who say, that sounds good, but how will all of this affect me?, there are many case studies at the end of the book and most people will likely find one or more of the case studies that will sound applicable to their own situation. I got this for my mom, who has been researching the family tree ever since her grandfather introduced her to family history, back in the early 70's. Her research has been the traditional method of following the documentation, until about a year ago when she started exploring DNA as a way to connect to distant cousins (and in turn, find out more about our family history). My father, her husband, is adopted so we have been avidly trying to find his biological mother and father. We had success with finding his mother, but the search goes on for his father. This book tackles the thorny issues of DNA research. The book contains an introduction to why DNA is important for research, the different types of tests that are available, and the current four main testing companies that have an internet platform for research. An in-depth review of each on-line site is given, along with a review of third party tool sites. If this sounds daunting, it isn't! The book is laid out like a textbook with many illustrations that will help the reader understand the text and the corresponding web-site. The author also gives many references for deeper understanding, so that even a beginner in family research will have a good strong platform to begin their research with. While this book appears to be specific for people searching for biological parents, my mom also found it helpful in giving guidelines for research when family research shows that there has been considerable inter-marriage which can skew the DNA results. So whether one is just starting out with DNA research, or has been at it for a while and wants to be sure they are using all the tools in their research tool-belt, this book is a great addition to your reference library. My genealogist mom highly recommends it. This book is extremely rudimentary; it tries to cover way too many topics in way too few words; it includes information and some how-to instruction that is already approaching obsolescence just 90 days after publication; and it was written by someone who, at the time of the writing, had less than three years experience with any type of DNA testing whatsoever, and who has no educational or practical background in genetics or biology. The book does have value for those completely new to the subject matter. However, there are better options for beginners, and self-study by reading authoritative subject matter experts on the internet will provide more thorough and more current information.